Google started to show suggestions when you type a query in Google Image Search one week after the worldwide rollout of Google Suggest for web search. The suggestions from Google Image Search include many specific words like "paintings", "pictures", "wallpaper", "cartoon", "photos", "landscape", "logo", so they're obtained by analyzing the most popular queries from the image search engine. It's worth noting that Google Image Search shows suggestions on the results pages as well, not just on the homepage. Google Suggest is now enabled by default in 3 Google search engines: web search, image search, Google Video and it can be disabled from the preferences page or by appending &complete=0 to the URL. Since August 2008, when the suggestions were first enabled at Google.com, some people complained that the feature is annoying, distracting and it disables browser's autocomplete. Others find it useful: "I rather enjoy this feature, it sometimes helps me form a more coherent search term that yields more results, and it also reduces the number of keystrokes since it finishes words for me even if I've never searched them before". It's also an idea generator, a way to explore trends, attitudes, reactions, and a tool that helps you type complicated queries. Now that most browsers and toolbars, all major search engines and many other important sites (Amazon, eBay, YouTube) offer query suggestions, people will expect to see them in any search box. The suggestion for google.com or image.google.com or video.google.com won't work here in china. only google.cn will show suggestions here. This is nice. 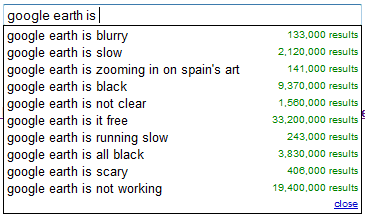 I think google suggestions gives nice search ideas. "Now that most browsers and toolbars, all major search engines and many other important sites (Amazon, eBay, YouTube) offer query suggestions, people will expect to see them in any search box." Now I wanna see the same done for instant search results. so, this is what was happening! I've got one word for you: COOL!!! I want old google image search. try http://njoybox.com/ its grest !